For some time this Radical has been saying “Must go to the Lord Northbrook” and finally managed it. Deputising a fellow ale drinker (please, no ‘craft’ beer) who last featured at the Kidbrooke Beer Festival, we meandered down Burnt Ash Road on a cold Saturday night. Unsure what to expect – so many renovated pubs go pastel shades and a bland safety designed not to offend anyone, except we Radicals – we liked the décor and ambience. Not too trendy but comfortable, light and airy. Plenty of comfy seating too, but we opted for a bar stool. 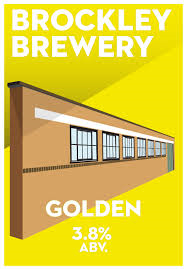 The barman(ager) was knowledgeable about the beers on offer and we opted for the fairly local Brockley Golden. A rather excellent pint. As we savoured this session ale conversation led to decent pubs outside the village. Is it the Old or New Tigers Head that has been closed for an eternity? Oh, there is a Wetherspoons! Never been in the Duke of Edinburgh… After a few more pints the decision was made for a bit of a pub crawl – a brave move given the ale on offer in the Lord Northbrook, but we Radicals are an intrepid bunch. First stop heading North was the Lord Halley, a Wetherspoons. We entered with an open mind and were bitterly disappointed. The ale selection was not great and the beer this Radical had was either pretty awful or off and was not consumed. The deputy had a forgetful beer and we decided to abandon the pub, leaving the drinks. Although not after a long walk to the toilets – possibly the furthest trek since I was last in Zero Degrees. Questioning our judgement of leaving the warm and friendly Northbrook it was with some reticence that we made for the Old Tigers Head (for it is the open one). Our first impression, aside from the lack of ale, was that it with a bit of an effort could be a decent boozer. As we supped on Guinness again or thoughts turned back to the Lord Northbrook and something similar could be done with the Tigers Head. We would rather see that than it end up like the New Tigers Head, but with only a handful of people in that is the fear. Subdued, nay, despondent we headed for the Duke of Edinburgh on Lee High Rd. Accepting the crawl was a monumental error we were considering heading direct for the safety of the Dacre Arms in Kingswood Place but a sense of duty to the crawl prevailed and we went in. The bar maid was friendly, the prices were (we vaguely recall), very reasonable, and there was a pump with the Brockley Gold on it. A mirage? No, and it was a good pint too. Spirits bolstered we took in the Edinburgh. A pub that is traditional in that there is a bar, plenty of pictures, comfy seating, slightly chilly loos, and a welcoming and pleasant place to be. We approved. It was not trying to be something else (no coffee machine, for instance). We were sorely tempted by a second pint but time was against us. With the success rate at a mere 50% we bypassed Rambles (formerly The Swan) further up Lee High Road – no pumps or ales visible – contemplated the future of The Woodsman which has been closed for much of the past 5 years, has been recently gutted, and is to let, and ended up at this Radical’s local, the Dacre Arms. Pints of the Reverend James all round and a review of the evening. Focusing on the positive: The Lord Northbrook is an excellent updated pub; the Duke of Edinburgh is fine traditional pub; the scampi fries and pork scratchings are one of the many reasons the Dacre is a decent pub. 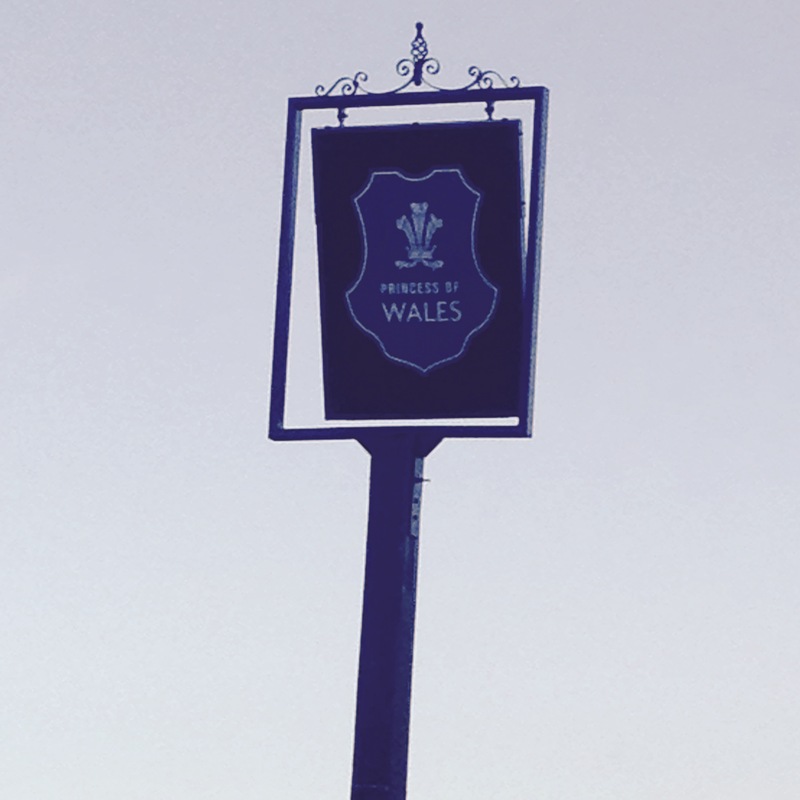 Though it’s been open again following refurbishment for over a week last night saw the official re-opening party at the Princess of Wales. Having written on the refurbishment, a full compliment of Radicals were very glad to accept the invitation and to take a peak at what had changed inside (on the outside, we’ve said before how pleased we are with the new sign, and the Farrow and Ball yellow paint is perfectly decent). what looks like a new conservatory at the rear – same size, but new roof/windows/doors. Quite cosy – will be interesting to see how it performs in summer (the previous conservatory had more glass, including in the roof). to fill it, a new set of tables and chairs (arranged in a much better way than previously) and a clever glass/wood panel to separate the bulk of the conservatory from the door to the beer garden which reduces the draft. the paint-work is a satisfyingly dark green, affording a cosy feel to the place. new booth style tables/chairs along the wall long-wall to the right of the building, again a better use of space. along the same wall an impressive collection of pictures featuring past Princesses of Wales (which prompted a long discussion about the status of the arguably the most famous holder of that title – we’ll leave it there). Overall a decent refurb, nothing major but what has changed has been well done. One point of interest – there seems to have been a bit of a buying spree of tea-cups which can now be found teetering on the edge of many surfaces in the Princess. You’ve been warned. 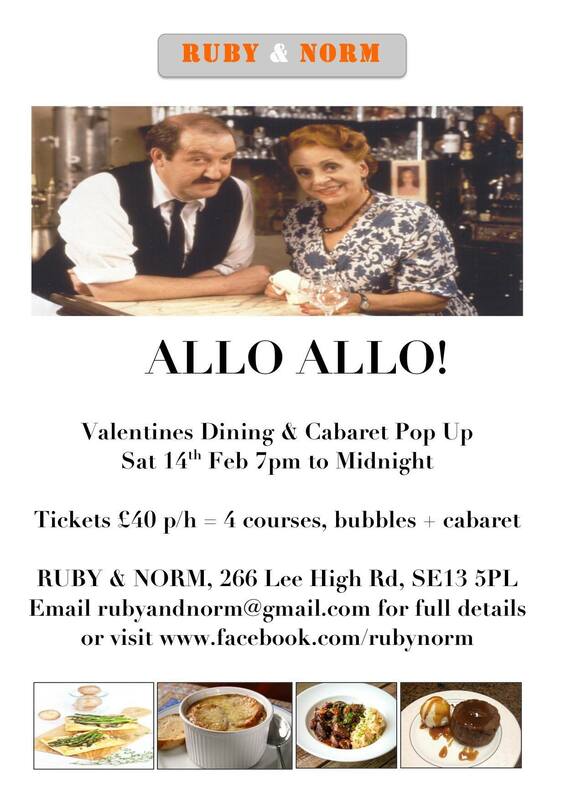 Okay, so you may have guessed we Radicals do not get too excited by the usual Hallmark Holiday mush that is Valentine’s Day, but the Revolt is willing to make an exception when the event is marked by an ‘Allo ‘Allo themed night at Ruby and Norm, Lee High Road. Fresh from a refurbishment and with Angie Ma back in the kitchen what could go wrong – well hopefully an evening will not follow the usual chaotic plot of the classic tv show. Points for working out the Officer Crabtree joke in the title! Ruby & Norm report that “Our amazing pop up chef Angie will be serving up the ultimate date night French feast….mini wild mushroom and asparagus pastries, french onion soup, beef bourguignon and celeriac puree with chocolate and salted caramel moelleux with vanilla ice cream and salted caramel popcorn for pudding – full vegan and vegetarian options available.” And fear not if you just fancy a bit of a laugh as sharing tables for non-couples are available. One word of warning, ‘Allo ‘Allo plots often involved Herr Flick and von Smallhausen dressing as women in their hunt for the Fallen Madonna with the Big Boobies. Although it always fooled the German guards, if you see two odd looking ladies with canes and limps, steer clear. Oh, and if you are caught snogging the waitress in the kitchen, the line ‘You stupid woman!’ followed by a reasonable explanation as to why the lady was in your grasp should suffice. £40 per ticket for 4 courses, glass of bubbles + cabaret – The Radicals recall Lt Gruber and General von Klinkerhoffen resorted to cheese to block out the delightful Madame Edith’s singing but it should not be necessary for the R&N cabaret! Previous evenings have been a success and a light-hearted take on Valentine’s Day should be equally popular.